Get your run in before the ice cream with this race. Everyone receives a sundae mug and a spoon and creates their own sundae from the ice cream buffet. The race benefits Carmel Middle School Athletic Booster Club. 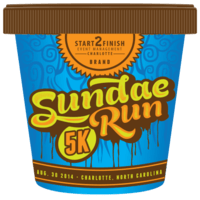 So what is a Sundae Run? We’re supplying you with customized ice cream sundae bowls so you can walk the ice cream buffet of flavors and toppings, sprinklers to cool off (bring a suit if you want!) and classic summer games. Everyone gets a sundae mug and spoon! You may also choose a KILLER SWAG BAG.